Check it out… they spelled my name wrong at the end of the video, but it’s not about me anyhow – it’s all about raising money for the ALS and Diabetes foundations… A few years ago, one of our crew members, Joey, was diagnosed with ALS. Since then, so much has happened behind the scenes. The cast is always so generous throughout each season, so the crew always gives back around the holidays by pooling money and giving them nice gifts baskets and vouchers for amazing restaurants in L.A.
A couple years ago, the cast made sure all that money went to Joey, to go towards his medical bills. In addition to our contributions, the cast wrote checks, and the total ended up being almost six figures. It was an emotional day, with all this going on in the “squad room” set, which is the orange-walled room with cubicles so often seen on the show. There was hardly a dry eye in the room. I know $1,000+ is steep for many folks, but if any of my friends happen to win the auction, I will send you a poster autographed by the cast and a season 12 “cast and crew” hat. I get about six weeks off work every year (unpaid), so projects around the home/apartment are a great way to keep from going a little stir crazy. 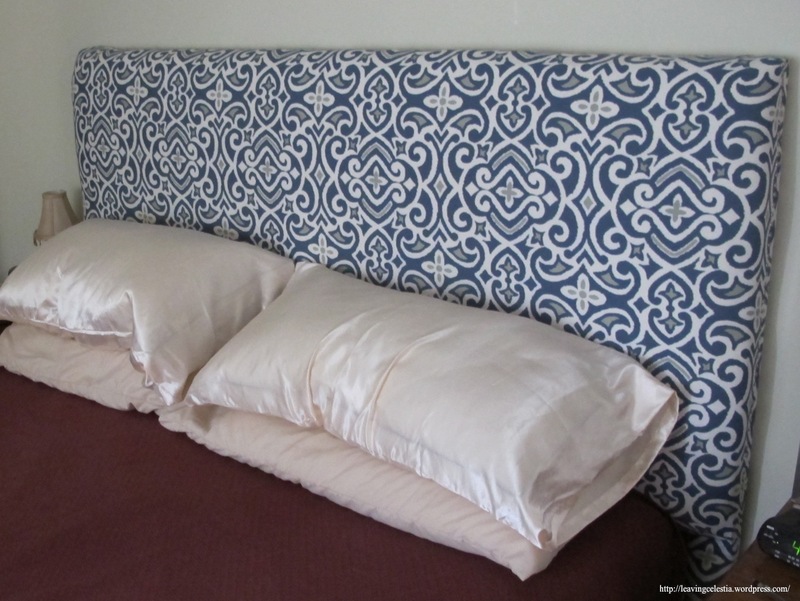 This time, one of the projects was to build a king size headboard from scratch. There are more headboard styles than I ever realized and, upon settling on the elegant, yet fairly simple “Cleveland” style, it didn’t take long to realize that making angular wood cuts isn’t very conducive to the limitations a small apartment and lack of a true workspace brings. 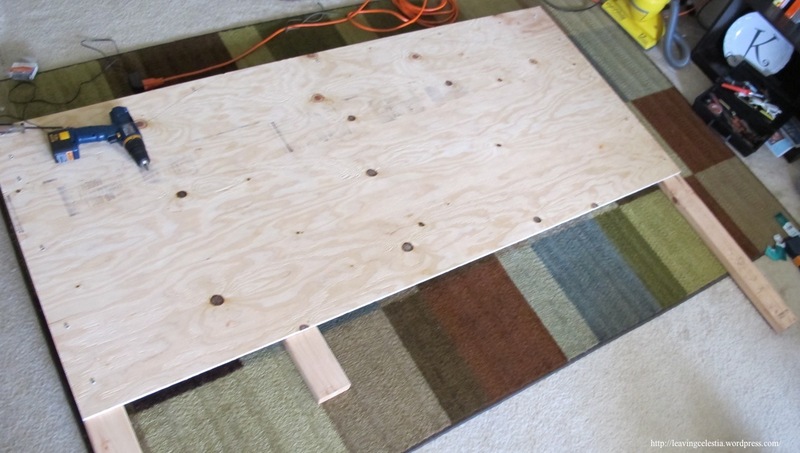 Thus, we decided to keep it simple – very simple – and left the plywood mounting board rectangular, which is the way we had Lowes cut it. 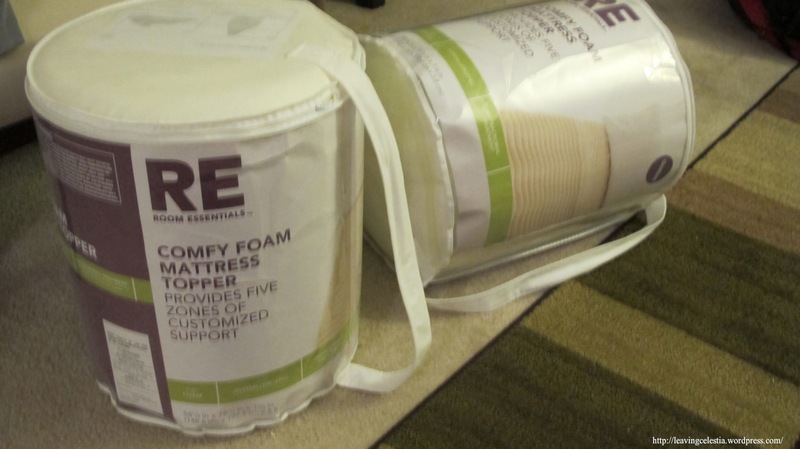 There are some shops in L.A. that specialize in foam, but the reviews on Yelp made them all seem more pricey than they need to be. 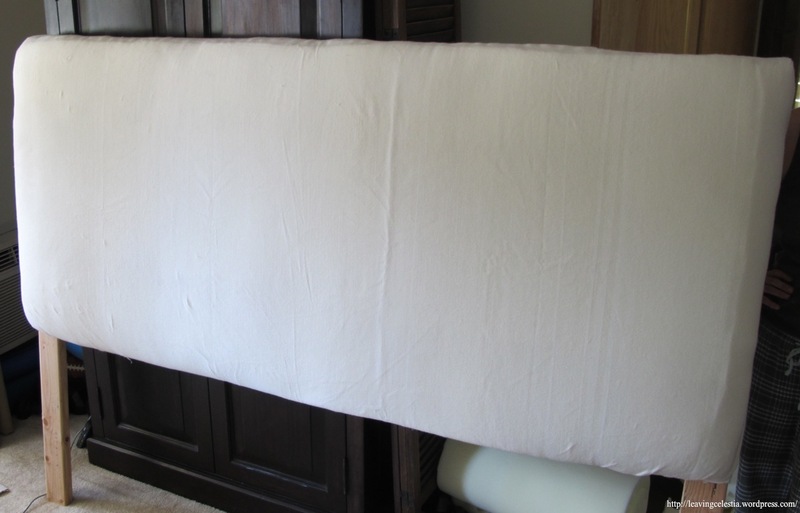 As an alternative, we bought two queen size mattress toppers, which can be easily cut up and pieced together as a backing on the mounting board. The other materials – the fabric, batting, and trim nails – all came from a fabric store. Also needed were a staple gun, wood screws, and spray adhesive. The “E6000” adhesive worked only well enough to get the job done. To start the labor, we mounted the 2×4 supports to the back of the plywood sheet. One support was attached to the left edge, one to the right edge, and one across the top to keep the plywood from bowing. The next step was to attach the foam to the board. 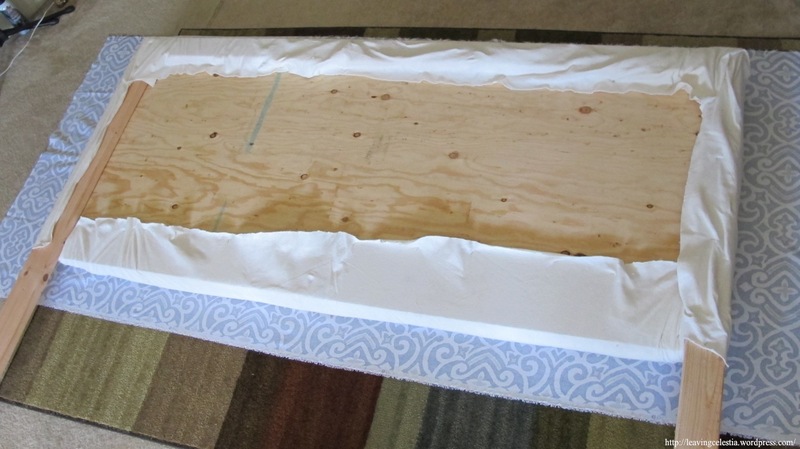 We found the best way was to roll up the foam and, as you slowly unroll it on the board, spray the adhesive on both the wood and the foam. As previously mentioned, the E6000 spray wasn’t so great, but the foam did stick after letting it sit for a while. From there, the second layer of foam was cut to size, then held in place while the headboard was flipped over on top of the batting. The batting was then pulled tight and stapled to the 2x4s (and plywood at the bottom). We then stood the headboard up to make sure there were no major wrinkles evident and that the foam was looking pretty even. Things were looking good, so the headboard was again laid face down in preparation for attaching the outer layer of fabric. We went ahead and stapled the top of the fabric to the top 2×4, following a point on the pattern across to make sure the fabric would appear straight on the visible side. The, the headboard was again stood up in order to double-check that the fabric looked straight. It did, so we proceeded to pull the bottom of the fabric tight, which was then stapled on the back to the plywood. Once that looked good, we pulled the sides tight and stapled those, too. What I was expecting to turn into a headache – mounting the headboard to the bed frame – turned out just fine. One mount on the bed frame appears bent, so I was wondering if I could straighten it out, if the wood legs of the headboard would need wheels, etc. It turns out, however, that the headboard is solid enough to stand against the wall, especially since the top of the bed supports the bottom of the headboard. I want to set the record straight. 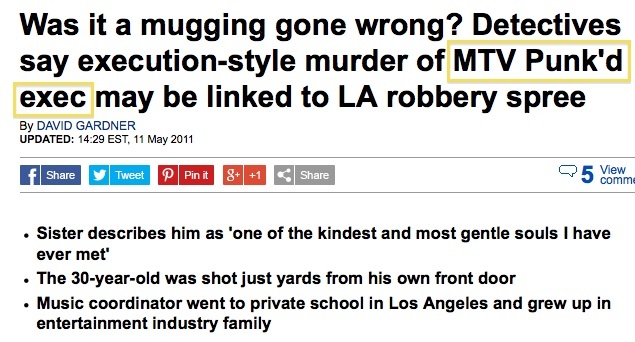 The above screenshot is from msn.com, taken on April 13, 2014. Recently, tragically, a young man was gunned down by police in what is being cited as a case of mistaken identity. It’s really a shame, as it was a senseless accident, and that young man was apparently eager and excited to get his professional life started. I empathize for his family and friends, but I have grown weary of the sensationalist crap put forth by the media. Facts are facts, and they can’t be changed by a headline. Below is from the LA Times, and is a more accurate representation of the truth. 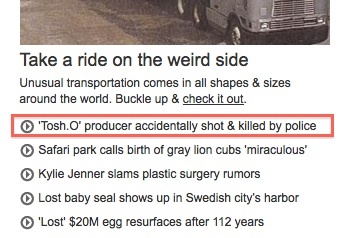 In other words, if you are in search of “news,” don’t trust MSN. A Production Assistant typically has a long road ahead to become a Producer. When this happened three years ago, I was constantly interested in story updates. After all, that took place in my neighborhood, and Ben-Meir and I both worked on “Dudesons in America.” I met him once but wouldn’t say I knew him personally. 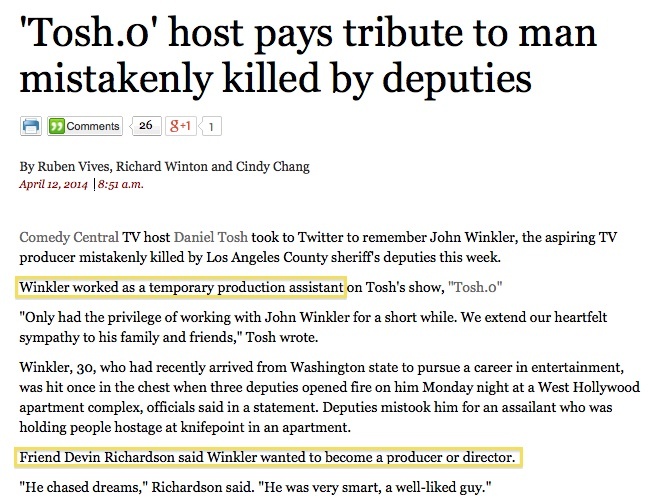 And what I couldn’t get, aside from another senseless death of an “aspiring” anyone/anything, was the association I saw on “Daily Mail” and other sites that promoted a “Coordinator” to an “Executive.” Based on the media’s logic, which is basically “Are you a Production Assistant? A Coordinator? Anything? Okay! Then you’re a TV Executive!” then I’ve been an Executive for seven years now. The only problem is that, as a Coordinator, I don’t make Executive decisions. I sometimes do make decisions that affect what a viewer at home sees on the screen, but the more crucial decisions I have to run up the chain – to my bosses, who are… well… you guessed it… Producers. I just discovered some extreme ignorance I possess regarding one of my guitars. It’s a Paul Reed Smith Custom 22, which I’ve owned for probably seven or eight years now. Coming from the old school, plain old tuning peg world, I restrung the PRS tonight the same way I always have – locking down the string with plenty of excess slack, then continually winding the tuner until each string reaches its proper pitch. It doesn’t seem like rocket science… until you think there’s a problem with your equipment and just realize the problem is that you’re behind times. 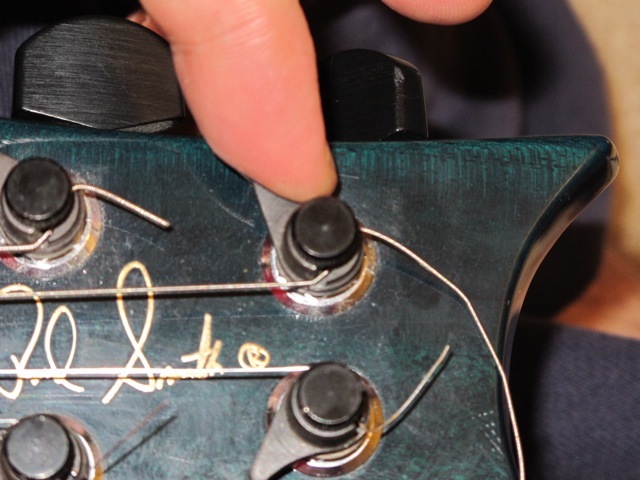 1) There is no need to wind the string around the machine head like on the old style tuners. Don’t do what is shown in the photo below. Rather, read on for proper instruction. 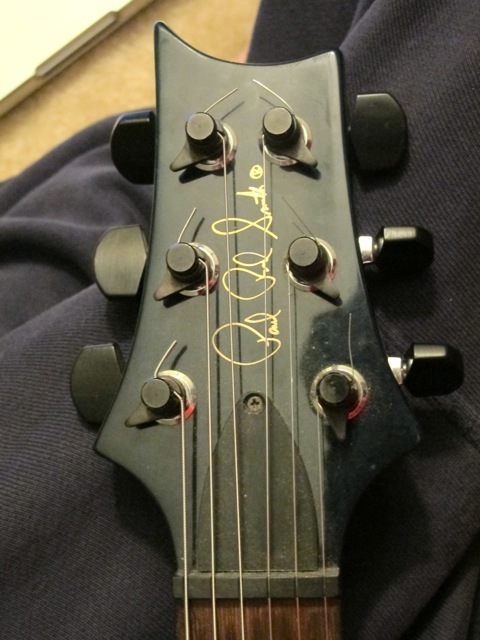 2) My whole concept of the Paul Reed Smith winged tuning pegs was just completely wrong. When you’re finished setting up new strings, the wings on the machine heads should flare outward from the guitar, and the top and bottoms rows of tuning pegs should be fairly symmetrical. 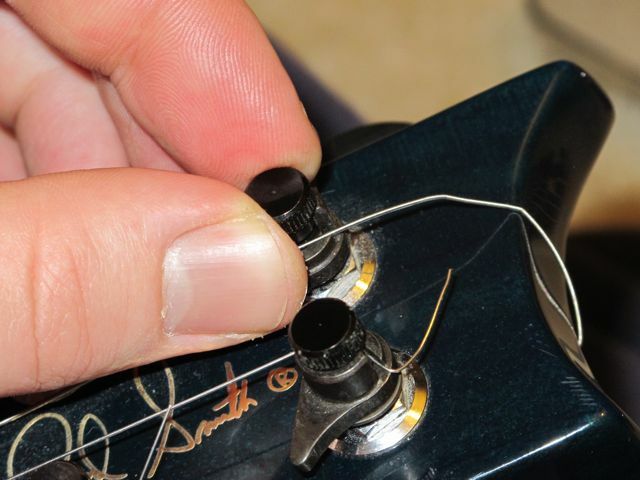 To begin putting on new strings, loosen the cap screw just a bit (no more than a quarter turn is needed). Flare the wing on the machine head outward, and line up the string in the slot, as shown below. No string slack is needed. While holding the string in place, hand tighten the screw cap, then begin rotating the tuning peg. The screw cap will continue to tighten and, once the machine head aligns just right, the string will begin to tighten. 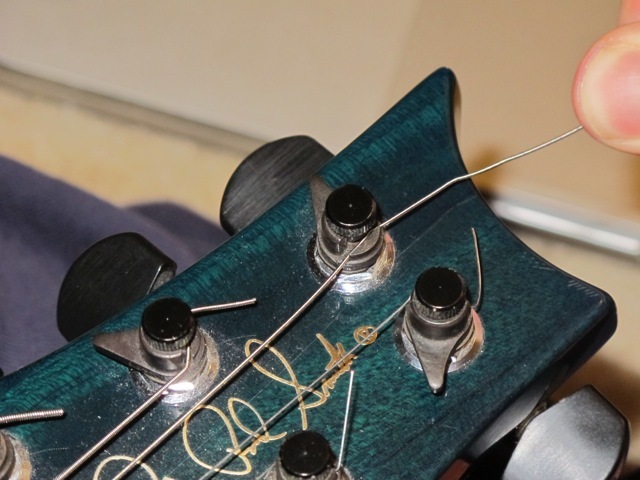 Once tightening begins, push the flat side of the wing in towards the middle of the headstock to lock the string in place. 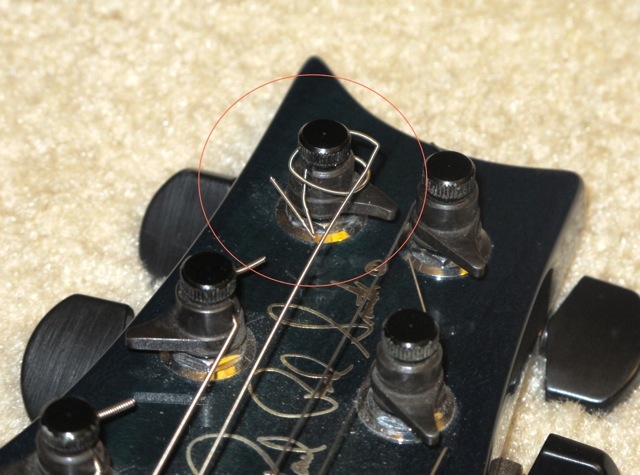 From there, bend the string back towards itself, snip of the excess string, and continue tuning the guitar up. FINALLY! After so long, this guitar has been properly strung. I’m read to rock, and hopefully you are now, too! If you have any questions about this process, feel free to let me know in the comment section below. Additionally, if you have benefited from this post, leave a little note or consider sharing this page. Thanks! Having worked on a number of reality TV shows, it was always part of my job to have people who MAY appear on screen sign “Consent to Use Image” forms. On one particular show, it was a rather tricky operation because there was a form for unpaid appearances, one for paid appearances, and two others for, uhhh, some sort of confusing, paid/unpaid stipulation. Ultimately, law can be a pretty murky area, so one photography professional I know always carries around $1 bills to compensate people for incidental appearances. If people happen to show up in video he shoots for commercial use, he gets them to sign the “Image Use” agreement and pays them a buck. His agreement form points out that they were paid – and how much – to further help avoid legal claims. Another important consideration for these “Image Use” forms is to jot down on the form itself a physical description of the people who have signed these agreements. In the long run, Producers and Video Editors can then determine much easier which people have already been cleared to be used in your production. The example listed below comes from a show I previously worked on. As I am in no place to dispense legal advice, I am conveying the information below “as is.” In other words, using the information given is at your own discretion, and you should run it by a lawyer to see if he/she has anything to add to it. I was/will be filmed, photographed, or recorded by ____(your company name goes here)____. In consideration of the potential exposure that this production may bring me, I ____(subject fills in name here)____ grant to ____(your company name here)____ and its agents, licensees, productions vendors, affiliates, subsidiaries, successors and assigns, the universe-wide, royalty-free, fully paid-up, irrevocable, and perpetual right and permission to (without my approval) use, publish, broadcast, and copyright (whether in digital form or otherwise) my name, nickname, persona, character or characterization, initials, logo, slogan or catch phrase, autograph, facsimile signature, voice, photograph, film, video or new media portrayal, actual, simulated or drawn likeness, images, biographical or historical information, any material provided by or statement made (whether oral or written) by me, and physical attributes including, but not limited to, any material based on or derived based on my likeness. I also agree to assume all responsibility for and hereby release and hold ____(your company name here)____ and each of its officers, directors, employees, shareholders, agents, licensees, affiliates and subsidiaries, harmless form any liability of any kind or any claim whatsoever (including, but not limited to, claims for personal injury or death, invasion of privacy, defamation, right of publicity or infliction of emotional distress) directly or indirectly arising out of or resulting in any way from my likeness being used by ____(your company name here)____ and I acknowledge that my likeness may be used in and in connection with still imagery, film and audio, affiliated with current and future ____(your company name here)____ projects. I acknowledge that there will be no compensation to me for being filmed, photographed, or recorded and the rights granted herein except as provided herein and that ____(your company name here)____ is not required to use my likeness. I also acknowledge that all materials produced under this agreement, including any photos, films, or recordings are the absolute and exclusive property of ____(your company name here)____ forever. This agreement shall be governed by and construed under the laws of the State of ____(your U.S. state)____ and the parties hereby consent to the exclusive jurisdiction and venue in the courts sitting in ____(your city and state)____. AT THE TIME THAT I SIGN THIS AGREEMENT, I AGREE THAT I AM EIGHTEEN (18) YEARS OF AGE OR OLDER. Once I get my domain website in order, I plan on making the document above a downloadable form that’s already formatted, so stay tuned. For more Reality TV / Documentary resources, check out this post: How to Conduct a Documentary / Reality TV Interview. Well… unless you feel your appearance is exploitative and tarnishes your reputation, don’t be a jerk and try to figure out ways to screw people out of money. There is already too much dumb litigation going on in this society, bogging down the courts and creating animosity between people. I’m no lawyer or judge, but I have taken Media Law classes that exposed me to real-world privacy cases. Chances are, if you’re trying to figure out if you can exploit people and seek damages for a situation where no harm was done to you, then you’re probably S.O.L. Were you in a public space when you were filmed? If so, you can’t have any expectation of privacy. Were you on film because you were in the proximity of a public figure? Then, you’re not the subject of the video. If you just happened to be in the background, you may – but probably don’t – have a case. Were you on the news? News is public interest. No money for you. If you were in a private space, are you sure there wasn’t a filming notice posted and, by entering the property, you were giving consent for your likeness to be used? If you were in the background of a show, do what I’ve done – laugh about it, share the exposure with your friends, and fuhgetaboutit. Unless Honey Boo Boo’s family made you look bad (by association), you were caught making out with a high schooler, or Snooki assaulted you, it’s probably not that serious. If it is, get off the internet and take the footage you were in to a lawyer, because you’re not going to get good, free legal advice through a Google search. As always, feel free to share this page via the social networking links provided below… comments are always cool, too!